Dog to dog aggression is by far the most common type of aggression I am asked to help with. A lack of socialisation is most often the cause; dogs being collected too late from the litter to make a real impression on the way the dog relates to other dogs can also be a common problem. Aggression in the parent dog can be a frequent reason behind such behaviour. By this I mean the mother or father dog is aggressive to other dogs, and this can be passed on as a learned behaviour or even as a genetic disposition. 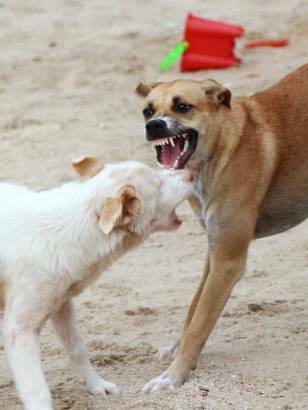 Should your dog be attacked by another (dog aggressive) dog, this may also have a huge negative impact depending on the severity of the attack and sensitivities of the dog concerned. Some dogs take such attacks to heart and can be emotionally crushed by such events, whilst others can recover well and carry on much as normal. Severe dog to dog aggression will need to start with the introduction of a muzzle over a short period, please read my notes for this, following the link below. On lead dog aggression towards other dogs is common as far as dog aggression complaints go, and this requires a particular approach to create a calm dog that is manageable in the process. Some breeds are more visually reactive than others, and again this behaviour can stem back to the dog's inadequate socialisation period.